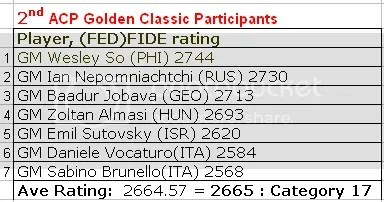 ACP Golden Classic 2014 whose 7-participants average rating is 2665, a category 17 (2651-2675), is one of the 15th strongest chess tournaments of the year according to chessdom.com. Filipino International Grandmaster Wesley So (2744), @ age-20 now World’s #15 player in the Live Rating list with 2747.4 and the 2013 World University Champion is the top seed in the tournament. The 2nd seed is Russia’s 24-yr-old Ian Nepomniachtchi(2730), World’s #25(Standard) & #3(Blitz), former Russian and European Champion (2010) and 2nd placer in the recent World Blitz Championship 2014. Other top players include Georgia’s #1 GM Baadur Jobava(2713), 8th-time Hungarian champion Zoltan Almasi(2693), 2001 European champion Emil Sutovsky(2620) from Israel and two of the strongest Italian players, Daniele Vocaturo(2584) and Sabino Brunello(2568). Per schedule, Round 1 (R1) starts 12 July 2PM (Bergamo time) or 8PM (PHI time). PHI time is 6-hrs ahead than Bergamo. Complete pairings/schedule could be found at the official site. Since there are only 7 players, an odd number, and there are 7-rounds mean in each round 1 player should take a bye. Therefore, after 7-rounds, each player should have played 6-games in the scheduled 7-round single round robin. GM Wesley So bye round is R5. 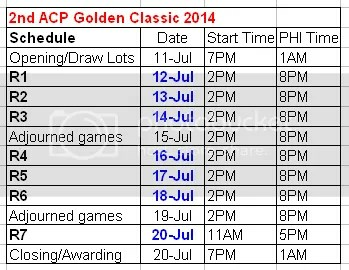 The ACP Golden Classic tournament reveals the long forgotten adjournment back into practice. The tournament is a seven player Round Robin. The rate of play is 150 minutes for the first 40 moves, followed by 60 minutes for the next 16 moves, followed by 15 minutes to finish the game with an increment of 30 seconds per move in the last period. If a game is not finished at the end of the first playing session (5 hours), the arbiter will ask the player whose turn it is to move to adjourn the game and ‘seal’ his move. This does not apply to the last round.